FARMINGDALE — Three people were hurt Sunday in a three-car crash on Maine Avenue. Assistant Chief Mike LaPlante of the Farmingdale Fire Department said three people were taken to area hospitals, including MaineGeneral Medical Center in Augusta and Central Maine Medical Center in Lewiston. Staff photo by Andy Molloy TIE UP: Three people were injured Sunday morning just after 10 a.m. on U.S. Route 201 in Farmingdale following a three car collision, according to police. A southbound Jeep crossed the center line, striking a northbound Subaru station wagon that was pushed into a Chevy Malibu, according to Kennebec County Deputy Sheriff Galen Estes. Patients were taken to MaineGeneral in Augusta and Central Maine Medical Center in Lewiston, firefighters said. The accident that reduced traffic to a single lane for more than an hour remains under investigation, Estes said. The most seriously injured was taken by a LifeFlight helicopter to CMMC. LaPlante said all of the injured were riding in the same vehicle. Three other people in the two other cars involved in the crash were not injured, LaPlante said. The identifications of all the victims was unavailable pending a press release by the Kennebec County Sheriff’s Office, which is expected today. 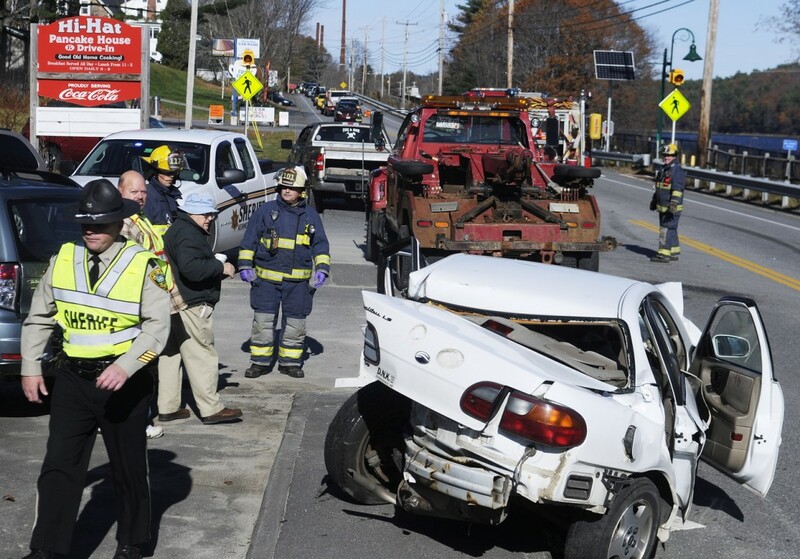 The crash occurred around 9:30 a.m., in front of the Hi-Hat Pancake House at 380 Maine Ave., which is U.S. Route 201. Kennebec County Sheriff Deputy Galen Estes said at the scene that a southbound Jeep crossed the center line and hit a northbound Subaru station wagon, which was pushed into a Chevy Malibu. It is unclear in which vehicle the injuries occurred. LaPlante said firefighters had to cut at least one person out of a car. Gardiner and Augusta rescue responded to the crash. Gardiner Rescue carried one of the injured farther south on U.S. 201 in Gardiner to meet the LifeFlight helicopter. Maine Avenue was closed briefly, LaPlante said. Traffic was reduced to one lane for more than a hour, causing significant backups.